Hey guys, you probably feel like I'm bombarding you with Halloween posts right now...probably because I am! Any holiday that involves dressing up and eating lots of chocolate/sweets is a great holiday if you ask me, so we may as well indulge since it's only once a year right? I hope you all found my last post at least a little helpful. Thanks to everyone who left a comment, I really love hearing your feedback and always check out your blogs so thank you. If you are still stuck for ideas, don't be afraid to ask me about it, I can't promise any expertise but I'll be more than happy to help! So my neighbour and childhood friend Katie and I had a pretty creative, Halloween themed day. First we carved the four pumpkins. I did not trust myself with the huge knife one bit, so I was rapidly put on 'ripping out the insides' duty. The mucky bit's always the most fun though isn't it? I did however chip in with the decorating (try stopping me!) which was very amusing. In between some surprisingly friendly looking monsters and a couple of funny looking Frankensteins, we managed to make a couple of good'ns so it wasn't all a total disaster on my part. Are you guys getting into the spirit of things this October? How have you been preparing for Halloween 2012? p.s. Check out this AMAZING nail varnish I found on americanapparel.net, so cool! Cute blog I just followed. 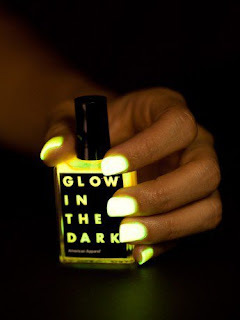 That's a really cool nail polish! I have so much halloween candy left over.